I’m such a sucker for black and white. I knew that’s exactly what I was going to do to these the minute I saw them hanging out next to a dumpster in the alley. 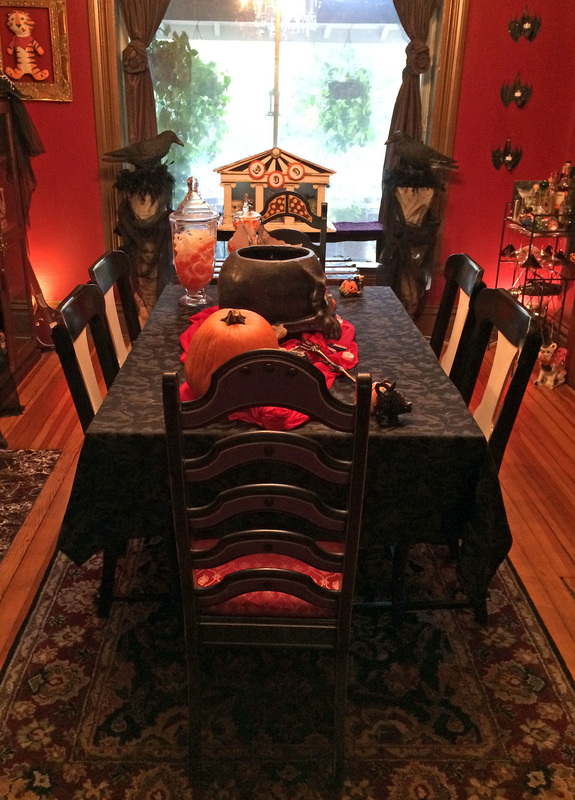 They were solid and in decent shape, good enough for a quick make-over to grace my dining room table. 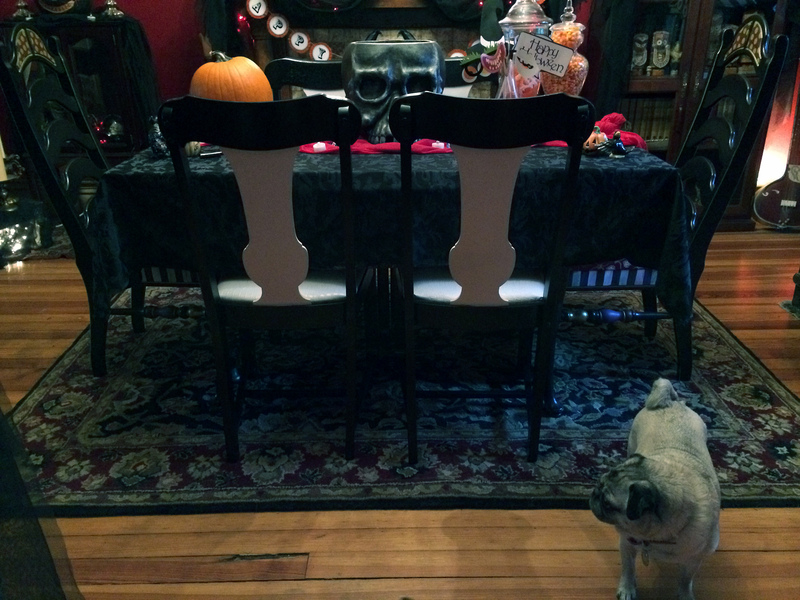 I’ll admit, they are not my dream dining room chairs (those would be the fabulous Louis & Victoria Ghost chairs by Philip Starke & Kartell), but until the beautiful day when I own those ghostly wonders, these will do just fine, thank you very much. 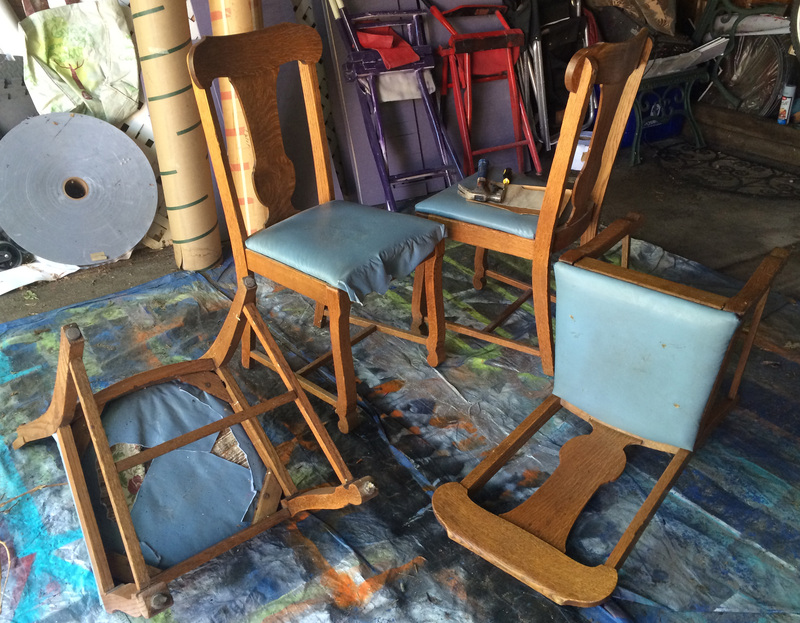 After I removed the seats and all those crazy fabrics, I sanded the chairs with a fine sandpaper to get them ready to paint. I then coated them with a gray primer, which I ran out of in the middle of the job. 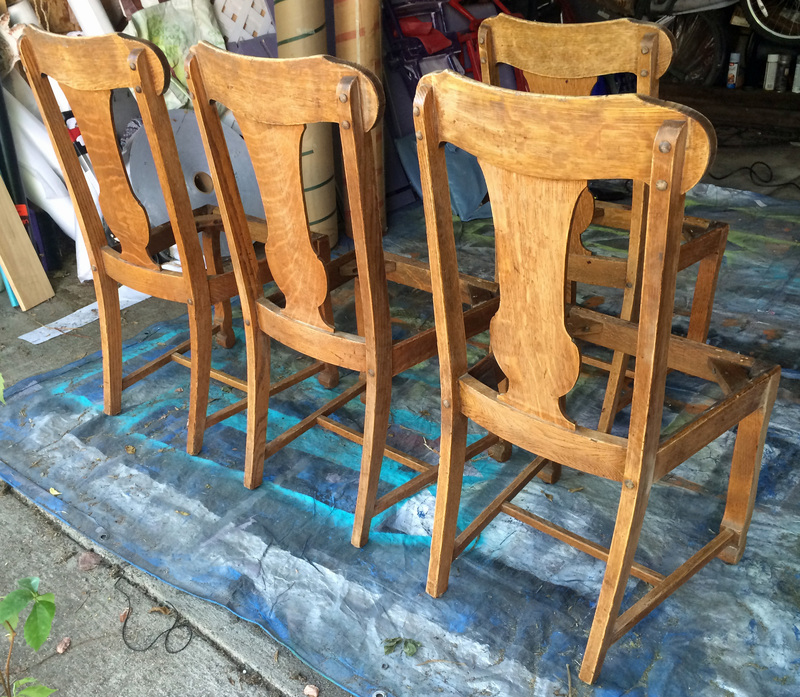 I got lazy and stopped there (I’d coated most of the chairs anyway ;-). They turned out just fine. I did the center parts in a white gloss first, 3 coats. After that dried overnight, I covered the white bits with newspaper and painters tape to protect them from the black paint. 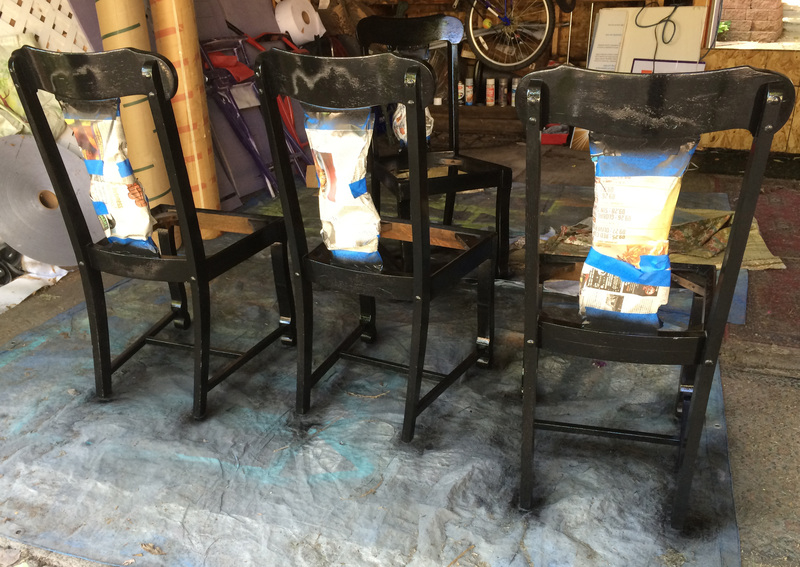 I ran into some weird issues with the black paint (you can see the all the strangeness on the backs of the chairs) so I had to let it dry and sand some more, then re-coat the chairs. I wound up doing 4 coats of the black gloss spray paint. I covered the seats in an awesome white reptile-pattern vinyl I picked up at last January’s 30% off sale at Denver Fabrics. I love it! Here they are in the dining room. Now I can actually have a proper dinner party. The best part is that all it cost me was about $45 in spray paint and fabric. PS: Want to more about those other chairs at the ends of the table? They were found chairs, too! 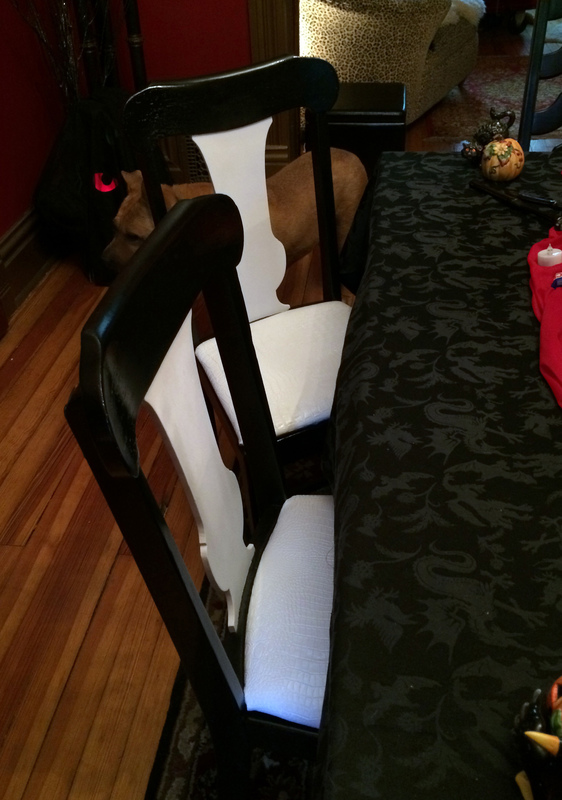 Mackenzie-Childs Style Chair Makeover. 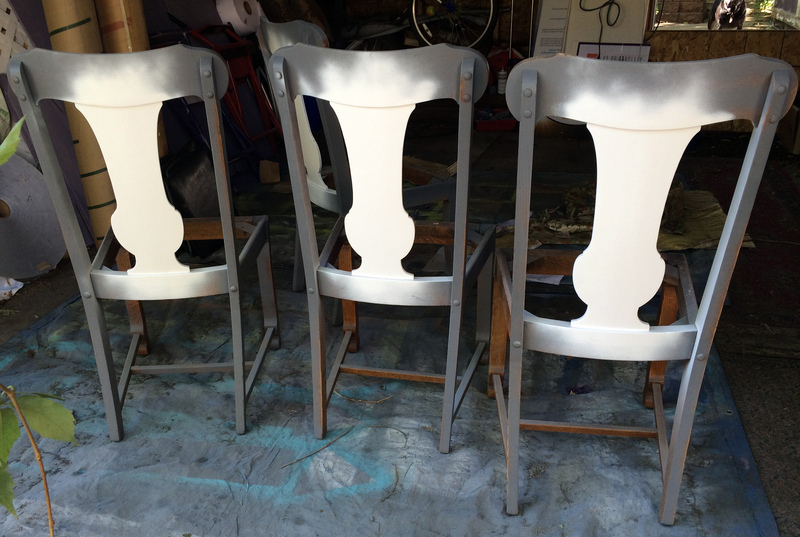 I found and made over these cool Vintage Folding Chairs too. 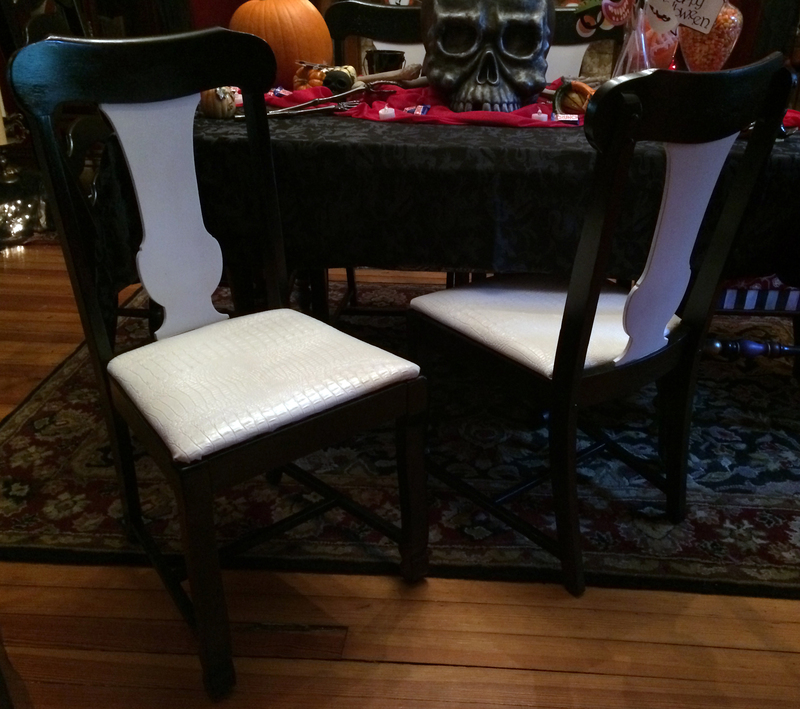 This entry was posted in decorating, DIY, furniture and tagged black white chairs, chair make-over, chair redo, DIY, diy chairs, diy furniture, dumpster chairs, found chair make-over, furniture make-over, painted chairs. Bookmark the permalink.